10 Reasons Why It Totally Rules To Be A Wedding Guest! Spring, summer or winter, the best season in India is the wedding season! Getting all decked up, gorging on delicious food and having no other responsibilities, being a wedding guest is definitely all about getting the best of this world. Here are 10 reasons why wedding guest fun is absolutely the best! 1. The party begins wayyy before! We are talking bachelorettes, sangeet rehearsals, mehendi and youngsters’ nights. It’s like several mini-parties thrown right before the mega bash! 2. Wedding guests are royalty! Remember Ranveer Singh crashing weddings in Band Baaja Baraat? Can we even blame him? Wedding guests are treated like royalty in India. We are welcomed, fed and entertained. I’d be a wedding guest at my own wedding for this! Some of our most fashion-forward ethnic wear sees the light of day during weddings. Mastani shararas, here we come! 5. Hum to baraati hain! We love creating a complete ruckus while dancing in the baraat. It’s one of the perks of being from the boys’ side! 6. Instagram queen for a day! Getting all dressed up and taking selfies with the bride, bae and everyone else is a legit wedding ritual, guys. It is the wedding guest who truly heralds the wedding season! What’s a wedding without some light flirting with the ladkewale boys? Competing during joota chupai and then showing them our moves on the dance floor- it’s all part of the fun. 8. Awkward encounters with relatives turn hilarious. Pretty soon. The same Auntyji who asked us about OUR marriage early in the evening will be showing off her Baby Doll moves on the dance floor later. And just like that, everything gets super hilarious. 9. Speaking of dance, we’re the party starters! Bollywood or hip-hop, weddings are that one time when we’ll dance to anything. From John Legend to Honey Singh, we mean absolutely anything! We might be working and living in other cities, but a wedding brings the #GirlSquad back together for an epic party! GIFs: Tumblr, Giphy HAVE A STORY IDEA FOR POPxo? If you want to hear about it, we can write about it! Just tell us your idea here! MUST-READ: 10 Wedding Guests You’ve Met At Every Single Shaadi! 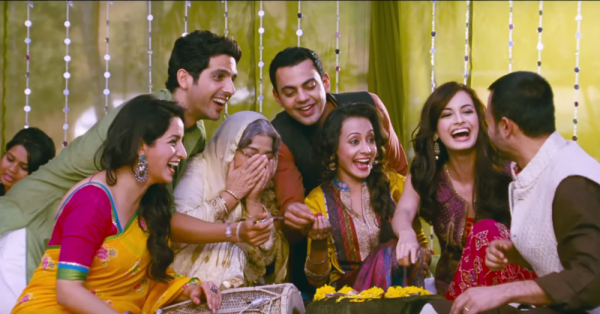 MUST-READ: “Baraat Kahaan Hai?”: 29 Things You Only Hear at an Indian Wedding!